In the evolutionary process of the Istanbul fish restaurant, there was a moment in the late 1990’s when the amphibious, shore-hugging boat restaurants crawled out of the Bosphorus and became land dwellers. Overnight, yellow Wellington boots became black loafers as seafaring grill men became restaurateurs and waiters. Some rue the day the municipality cleared the Bosphorus of its smoking flotilla of fish restaurants, but we never found dining aboard them very pleasant. That slight roll of the sea underfoot may feel “authentic,” but we’ve seen it send a can of Fanta sliding across a rickety table, drenching a freshly grilled fish in orange pop, then rolling around on the filthy floor of a cramped dining space that was always filled with fishy grill smoke. Luckily, the land-based versions of these fish restaurants are extremely pleasant, across-the-board affordable, of reliably good quality and family-friendly. Adem Baba, located in Arnavutköy, is our favorite example among the formerly seaborne fish restaurants that have migrated to land. But further up the Bosphorus lie another couple of boats come ashore that deserve attention. At Takanik, there is much to remind you of the venue’s former glory afloat on the Bosphorus. 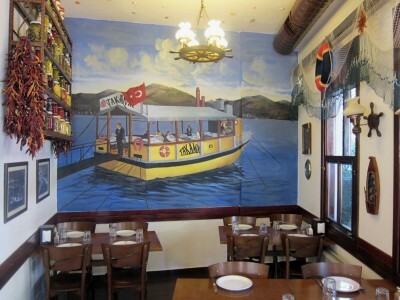 Among all the fishing boat paraphernalia that decorates the dining room is a mural depicting the old Takanik boat-restaurant in action, as a sort of memorial. We find it hard to believe that food of this quality could have been served on the boat. Our meal started with plates of cool pickles, beets, eggplant purée and grilled red peppers – on the house(boat). The fried calamari we ordered was pillowy soft and not at all greasy. Thebalık köftesi were distinctly handmade patties of roughly chopped fish laced with onions and parsley, unlike the heavily battered croquette type of balık köftesi found in some other fish restaurants. Our dil şiş – sole skewered with lemon, tomato and peppers – was just fine, although not on par with what’s served over at Adem Baba. We wish we’d taken a cue from the table next to us, where one elderly Istanbulite spoke at length to the waiter about his love ofsardalya (fresh sardines), which he’d come that day specifically to eat. It was the first he was eating this season, he told the waiter, who took the order with visible pleasure. We knew the feeling; a year’s anticipation of good, fresh sardines can make a simple meal into something worth carrying on about. Fish Var Balıkçı-1 is the result of the union of two restaurant vessels that were formerly docked across from the Austrian Consulate in Yeniköy, slinging fish sandwiches and simple plates on the waterfront. The outcome is an excellent, if predictable, family-style fish restaurant on the coastal road in İstinye. Among the standards – including seasonal fish served grilled or fried, calamari, and a cool çoban salatası (shepherd’s salad) with cheese – was a memorable balık kokoreç of pan-fried cubes of sea bass among peppers and onions in a broth that reminded us of a curry. As we left, we saw a waiter running a heaping order of balık ekmek – the classic grilled fish sandwiches – across the street to an idling boat filled with day-trippers. For some, it seems, old habits die hard. You simply CANNOT get good fish in a restaurant in Istanbul. Always dry, overcooked, tasting of rancid oil (even if grilled) going fish is never the star in Turkey. 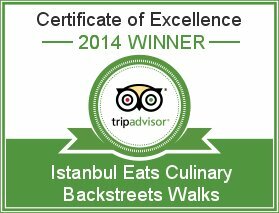 You should only judge a fish restaurant in Istanbul by the meze. I have long marveled over how a sea-faring country can mess up fish so royally . . 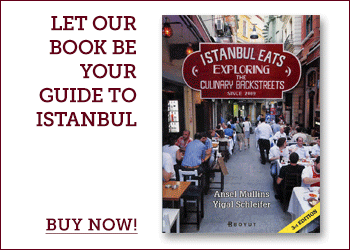 There are almost as many fish restaurants in Istanbul as there are fish in the sea and many are NOT great. But we do stand by these selections which are reliably excellent. 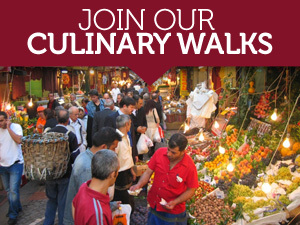 We find that Istanbul can be a great place to eat fish if you cast into the correct spot.